Since I learn about all these tools online, I often assume that everyone already knows/is using them. But I often find my friends responding in the negative when I ask, “Oh, have you heard about [insert service here].” After hearing this numerous times, I decided to assemble a list of cool stuff I’ve found and use. Some are operating system independent others are iOS/OS X specific (since that’s what I use), but hopefully you’ll find something that can enter your workflow and save you some time and energy. Then I heard about Credit Karma, which shows you your credit score for free. Free as in free beer. No credit card required. 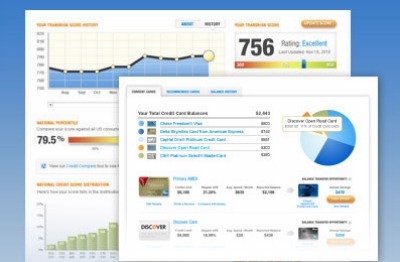 Rather than offering a “free” credit score then charging a monthly credit monitoring fee, like some sing-song sites, Credit Karma makes money by partnering with different credit card companies earning affiliate cash. Everyone wins. I’ve long been frustrated by the lack of access to information as personal as my own credit score. It’s always seemed to me insane that companies like Experian, Equifax, and TransUnion are allowed to hide behind such shrouds of secrecy and bureaucracy. I would always request my free credit reports, but even that process is muddled and made me feel distanced from my own information. Basically, I’m really happy I found Credit Karma. It makes me feel in the loop again. Dark Sky is more of a fun tool than anything else. 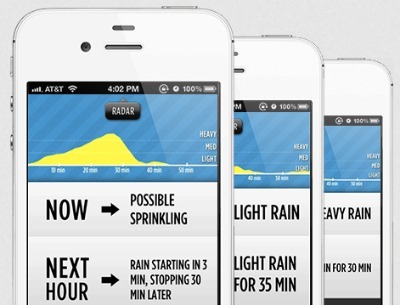 Basically, it’s an extremely targeted weather app, targeting only on rain within the next 24 hours. While this may seem limiting, this intense focus has created a really interesting, useful, and unique product. I have the app set to send me a push notification whenever it’s about to rain. The application is amazingly accurate, and usually within about 5 to 10 minutes of the alert it’ll actually start raining. It’s also really handy to look at the rain report for the upcoming hour, checking for breaks in the rain. Even when the information provided by the app isn’t useful (like when I’m sitting at work or otherwise stuck inside) I always find value. I enjoy being able to scroll through the storm and see the projected rain patters. I like knowing that the rain will stop in 20 minutes or if it’s going to pour for the next hour. It’s absolutely fascinating. Download Rapportive right now. Stop reading the article for a moment and install Rapportive. Seriously. This is the only item on this list where I’m making this statement, just do it. 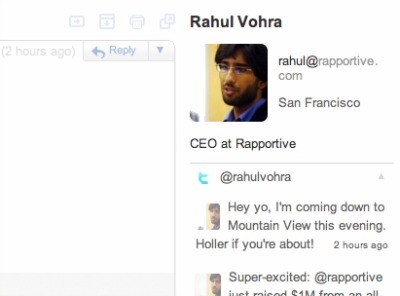 Rapportive is a browser plugin for Gmail which adds contact profiles directly into your email workflow. Instead of ads, you’ll see a picture of the person you’re emailing, their work title, as well as recent tweets, Facebook statuses, and social media profiles — assuming this information is public or you’re already connected via each social network. Rapportive is fantastic for putting a face to a name and getting some context to the conversation. It’s fantastic for networking, since adding someone on LinkedIn can be done with a single click. It’s also a great tool if you’re trying to find someone, as you can take guesses at their email address until the correct Rapportive profile populates. Rapportive is the first browser plugin I install when I get a new computer/browser. It’s the first thing I recommend when talking to someone about email/Gmail. It’s an invaluable tool to my workflow. There, was that enough of a sales pitch for you? I usually get one of two reactions when I talk to people about If This, Then That. Either people have never heard of the service, and stare at me with blank eyes, or they’ve absolutely heard of it and seem surprised that I’m even asking. IFTTT is exactly what it sounds like, a way to set up if this, then that rules for almost anything on the internet. It operates by checking for triggers and executing actions based on those triggers. If you favorite a tweet, then save it to Evernote. If you post a photo to Instagram, then save it to Google Drive. If it is going to snow, then send me a text message. And on and on with over 50 different services. I use IFTTT to automatically post my blog posts here to Tumblr, to post shared linked on Facebook to LinkedIn, and to email myself if it’s going to rain. You can browse through popular “recipes,” or make them yourself. If you’ve ever wanted to automate two seemingly unrelated services, IFTTT can probably find a way. As I’ve written at length before, I use MediaWiki to have my own personal Wikipedia (appropriately dubbed WikiDannia). This is the best way for me, personally, to layout and organize my brain and links I want to save. Some people use Evernote, other’s Pinboard, and others one of the many websites and services trying to capture a slice of the productivity space. 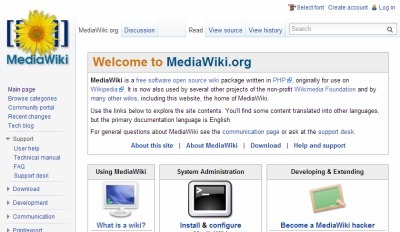 For me, a private MediaWiki install is the answer. While I’ve had a few people contact me, after reading my article, letting me know of their own Mediawiki installs, I don’t expect this process to appeal to everyone. It’s a bit complicated and takes work to edit and maintain — not a lot of work, but more work than, say, clicking a bookmarklet and maybe adding a few tags. MediaWiki makes this list mostly because it’s usually a surprise addition to the personal productivity market. I can’t remember my specific “ah-ha!” moment where I realized MediaWiki would be perfect for my needs, but I haven’t yet met anyone who had come to the same realization on their own, although I’m sure they’re out there. 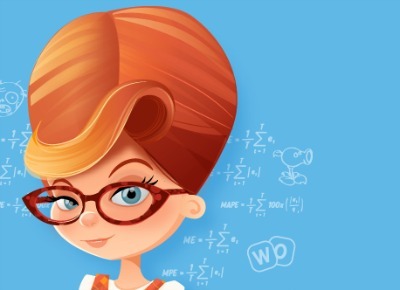 App Annie is a fantastic tool for mobile app developers. 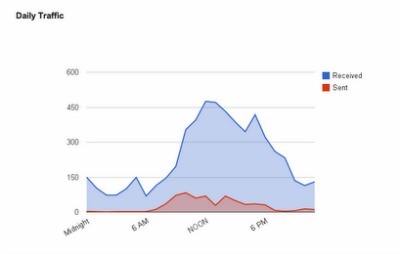 It’s a set-and-forget service that sends a daily email with Apple and Google app sales from the previous day. It also shows percentage movement from the previous day’s sales as well as any new reviews. If you’re a mobile app developer, this free service is definitely worth checking out. Marco Arment, the creator of Instapaper, has a great post about keeping an Apple developer account secure when using services such as App Annie. Definitely worth a read if you’re setting up App Annie. 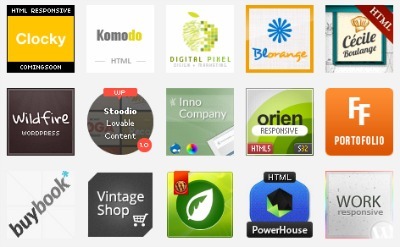 ThemeForest.net (affiliate), and the entire Envato family of websites, has been extremely valuable to me. Not only have I purchased multiple themes from the site, I’ve also gotten great deals on bundle promotions, videos, and code snippets. I even used CodeCanyon to find a developer for my iPhone app Reader Tracker. Prices are pretty fantastic, too. Themeforest has saved me countless hours. And their affiliate program is pretty great as well. My blog post about creating Reader Tracker has generated roughly $40 worth of credit, effectively paying for my last few purchases. I love quantifying my behavior. I’m almost always wearing my Fitbit and I will randomly find myself checking my Facebook analytics on Wolfram Alpha when I’m bored. So when a post about a Google Apps script called Gmail Meter made it to the front page of Hacker News, I immediately set it up. Gmail Meter is a set-and-forget script that simply sends you can email every month with your email usage stats for the previous month. How many emails you sent and received, your busiest days and times, length of incoming and outgoing messages, everything. It’s complete with graphs and charts and comparisons to the previous month. I had no idea that Google Apps spreadsheet scripts even existed. Nor that something as incredibly cool could be done. The best part of Gmail Meter is that none of your personal information is sent elsewhere to be processed (like with the Facebook analytics, which is processed by Wolfram Alpha). It’s all done through your own Google Apps suite. In 2010, I decided to free up some space on my hard drive by transferring my entire music library to an external drive. This was fantastic, until the external hard drive crashed and I lost everything. I’d spent years building that collection, and now it was gone. For two years, I would open iTunes and just stare at all the song names that were now nothing but broken file links. From then on, I decided to always backup my important files, especially pictures, videos, and documents. I decided to go with Backblaze for my notebook backups, as it’s only $5/month and runs completely in the background. It fits my favorite theme of set-and-forget services. I’ve never had to use it yet, thankfully, but I rest much easier knowing that my laptop is constantly automatically storing all my files to the cloud somewhere, just in case. Oh, Quicksilver, how I love thee. 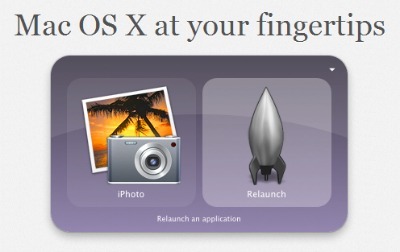 Quicksilver is a free OS X application launcher. I simply type Command-Space and start typing the name of an application or document and can immediately launch the selected file. Anywhere, any time. While that’s all I really use, Quicksilver is actually a lot more powerful and can perform actions as well as simply opening files and apps. You can interact with applications by installing plugins, which let you send emails, play music, or launch websites directly from Quicksilver. It loads super fast and learns from your behavior. It’s the little things that make life better, and Quicksilver is definitely a helpful little tool in my collection. Thanks for sharing these. I really like IFTT! I have only begun to use it. Right now when I post to Instagram it will automatically post to Facebook. I have a lot more to figure out. I’ll also check out some of the others you list.